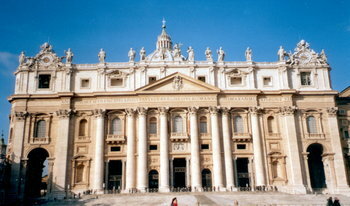 St. Peter's Basilica (Italian San Pietro in Vaticano) is a Catholic major basilica in Vatican City, an enclave of Rome. This building is often described as the largest church ever built (it covers an area of 23,000 m² and has a capacity of over 60,000) and one of the holiest sites in Christendom. Construction on St. Peter's was begun in 1506 and finished in 1626. Tradition says it was built at the place where St. Peter, one of the apostles of Jesus and considered the first pope, was crucified and buried. The church hosts the tomb of St. Peter under the main altar. Other popes are also buried in the basilica, as well as below it. The current location is undisputedly the site of the Circus of Nero in the first century AD. After Emperor Constantine officially recognized Christianity he started construction in 324 of a great basilica in this exact spot, which had previously been a cemetery for pagans as well as Christians. In the mid-15th century it was decided that the old basilica should be rebuilt. Pope Nicholas V asked architect Bernardo Rossellino to start adding to the old church. This was abandoned after a short while. In the late 15th century Pope Sixtus IV had the Sistine Chapel started nearby. The basilica in itself is an artwork composed of many artistic elements of value. Construction started under Pope Julius II in 1506 and was completed in 1615 under Pope Paul V. Donato Bramante was to be the first chief architect. Many famous artists worked on the "Fabbrica di San Pietro" (as the complex of building operations were officially called). Michelangelo, who served as main architect for a while, designed the dome. After the death of Julius II building was halted until Pope Paul III asked Michelangelo to design the rest of the church. After Michelangelo's death his student Giacomo della Porta continued with the unfinished portions of the church. Carlo Maderno became the chief architect later on, and designed the entrance.